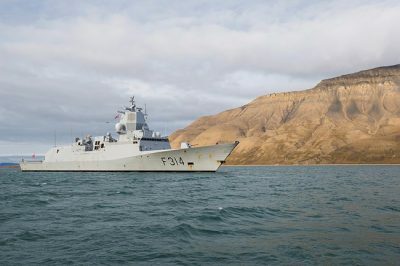 Norway’s fleet of five frigates has been swamped by troubles almost since the first one was delivered nearly 11 years ago. Now the Defense Ministry itself agrees with strong criticism from State Auditor General Per-Kristian Foss, and claims to be working hard to address the problems. Foss, a former government minister himself for the Conservative Party that now controls the Defense Ministry, has issued unusually harsh remarks about the state of the frigate fleet. It’s supposed to serve as the “backbone” of Norway’s naval forces but all five vessels have been plagued by technical trouble, a lack of access to reserve parts and a lack of crews and training for naval personnel. In addition, according to the report from Foss’s auditor general’s office (Riksrevisjonen), the vessels suffer from a lack of routine maintenance. The situation varies from vessel to vessel, but all five frigates contain “weaknesses,” and the auditor general claims most of the responsibility lies with the ministry. The five frigates were acquired from 2006 to 2011, during the former Labour Party-led government, at a cost of NOK 19 billion following budget overruns. The initial plan was to have four of the vessels operative at all times, with one used for training while another could be in for maintenance. The state auditor claimed that plan has not been followed. One of the reasons is that the vessels require regular overhauls, and the lack of available spare parts for them has led repair crews to “cannibalize” the other vessels. That’s led to berthings while functioning parts on one vessel are transferred to be used on another. The vessels have also lacked the weapon systems they were supposed to have. They were supposed to be equipped with NH90 helicopters, an important weapon against enemy submarines, but they won’t be in place until 2021 after excessive delays. “This all means that the vessels will be without one of their most important functions during a large portion of their lifetimes,” said Thor Haakon Kundsen, a department director in the state auditor general’s offices, when presenting the report. The current ministry blames the helicopter producer for the delays. “The consequences this has for the frigates’ operating capacity is extremely unfortunate,” Søreide said, while stressing, though, that the situation is improving. The auditor general’s report was first delivered to Søreide’s ministry last June but much of its content was withheld, even from Members of Parliament, because it was labelled as “Top Secret.” At the ministry’s request, the auditor general declassified the report so that a summary of its contents could be released this week. Anniken Huitfeldt of the Labour Party, who leads the Parliament’s foreign affairs and defense committee, told new bureau NTB that she now expects the defense minister to do what’s necessary to make sure all five frigates are operative. “With our large areas at sea, we need functioning frigates,” Huitfeldt said. She needs to be careful, though, since her party held government power when the frigates were first delivered in 2006 and for the next seven years when the others came on line, needed routine maintenance and when the helicopters should have been on their way to the ships. Complaints from the military over the lack of maintenance and functionality began as early as 2009, when Huitfeldt’s former political colleague Grete Faremo was defense minister for the Labour Party. Faremo’s predecessor, also from Labour, failed to boost defense budgets enough to pay for all the needed maintenance and “chronic understaffing” of the frigates when Jens Stoltenberg was prime minister. He now heads NATO and has grasped the need for bigger defense budgets after recent years of rising tensions with Russia and all over the world. Stoltenberg has been urging Norway’s Conservative government along with others all over Europe to boost their defense spending to at least 2 percent of gross national product since he took over at NATO in 2014.